GrabCAD Voxel Print unlocks the full potential of multi-material and multi-colour 3D printing by allowing the user to precisely control the print at the voxel level in order to create new structures, textures, colours and more. By unlocking manipulation of material concentrations and structures at the voxel level, GrabCAD Voxel Print empowers you to create entirely new Digital Materials for your specialized needs. GrabCAD Voxel Print lets users control the physical characteristics of their model down to the individual voxel level, including all interior elements. Change the way you design and fabricate multi-material parts by controlling how your ideas come to life down to the individual voxel. properties, but also by the interior material properties. 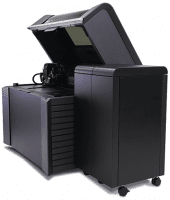 3D printer to produce a range of composites that meet popular industrial requirements.